At the recent Lyon film Festival in France, there was a Sergio Leone and Don Siegel tribute. Clint was of course present. you can buy all of those at eBay, they're listed there for months and years now. Yes, all of them except the one with Clint and Leone in the helicopter (about to film the ending shots of GBU that couldn't be used cause the copter was so shaky). I did buy a couple from that seller, the quality was ok but the printing wasn't true black and white - the pics were kinda purple. they are fantastic. But it took my a while. He's good at it too. GOD!!!!!!!!!!!!! Henry Fonda doesn't look as menacing sitting on his high chair instead of his horse. The last photo is interesting with Leone standing by the camera as they film that guy shooting the gun. Great picture from Shalako Mike. Isn't that Woody Strode as the Indian. 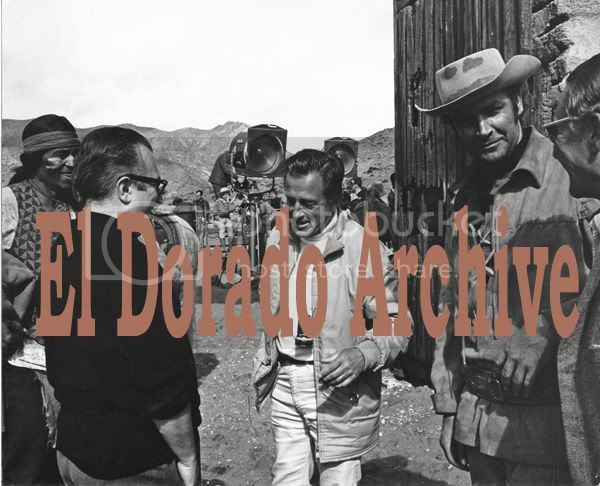 Filming in Almeria 1968. Well he didn't have to travel far for his next film.